In our last post Tim wrote about avoiding the temptation to view our engagement period as a stressful time that we “just have to make it through.” Instead, we are called to view this time as prayerful preparation for the Sacrament of Marriage. Today I’m sharing a few of the ways we have tried to keep our eyes fixed on the sacrament instead of the stress! Early in our engagement, Tim and I decided to do some spiritual reading together to help us prepare our hearts for the sacrament. We chose Men, Women and the Mystery of Love by Edward Siri and Theology of the Body for Beginners by Christopher West. These are both books that we’ve dabbled in before but never ended up finishing, so we figured this would be the perfect opportunity. Saint John Paul II has been a wonderful patron of our relationship and has helped us understand so much about ourselves, about each other, about God, and about the vocation to which we have been called. I honestly feel that God truly revealed His vocation to us through Saint John Paul II. As we are nearing the time when we will fully enter into the vocation of marriage, it has been an incredible opportunity to reread some of JPII’s words and to be reminded of what exactly this vocation is – the beauty of it, the great mission it carries, the challenges and crosses we may face, and the great joy that will flow out of it. Both of these books also offer study questions at the end of the chapters that provide a great opportunity to further reflect on and discuss the material covered! 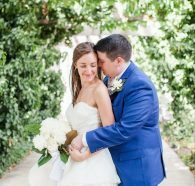 A novena to St. Jude for the healing of relationships: We prayed this one at the beginning of our engagement when wedding planning was really taking its toll on us! We knew that we were not loving each other as the vocation of marriage calls us to and so we reached out to St. Jude for healing. And boy, did he provide. A novena to St. Josemaria Escriva for a Happy and Faithful Marriage: We prayed this one about six months into our engagement when we started to feel complacent and like we had a lull in our preparation and planning. I loved this novena because it has unique reflections and prayers for each day! A novena to St. Joseph: We have prayed this one a few times throughout our engagement, for various reasons. St. Joseph is the patron of workers, and so Tim and I turned to him when we were graduating college and looking for jobs. As the memorare at the end of the novena says, “Remember, most pure spouse of Mary, ever Virgin, my loving protector, Saint Joseph, that no one ever had recourse to your protection or asked for your aid without obtaining relief,” we are living proof of not being left without relief to our prayers. We have also often turned to him in times when we needed trust in God’s plan or were reflecting on our call to the vocation of marriage. Mary isn’t only the queen of the saints in heaven; she has also been the queen of the saints in our relationship. Mary has played an irreplaceable role in bringing us together, helping us cultivate a shared prayer and spiritual life, and helping us discern our vocation. Praying the rosary has very much been the spiritual rock of our mutual prayer life over the years. Anytime during our engagement when we have felt like we needed to pray for something and yet didn’t know exactly what or didn’t have the exact words, we have turned to our Blessed Mother to intercede for us. Moreover, knowing that this vocation is of God and that we have been asked to live it out in a worthy manner, we have entrusted it to Mary, who was the most perfect wife and mother to ever exist. When we got engaged on the Feast of the Annunciation, we knew that it was only the first of many times that we would be asked to follow in Mary’s footsteps and say “yes” to God’s will for us. If you would like to learn more about Mary, cultivate a deeper relationship with her, or entrust yourself to her, we highly recommend 33 Days to Morning Glory, a preparation for Marian consecration! One last prayerful way Tim and I have tried to keep our eyes focused on the sacrament is inviting others to pray with and for us! We know that the vocation of marriage is about more than just us, and so we have invited the community of our family and friends to join us on this journey of preparation. Right after getting engaged, we made prayer cards to give out to family and friends so that they could pray for us right as we began our journey to the altar. We sent out our save-the-dates a few months later and again included a prayer so that our guests could continue to support us on this journey. When our invitations go out next month, our guests will receive yet another prayer opportunity. This time it will be a novena that we are inviting them to join us in praying the nine days leading up to our wedding. Having our family and friends support and pray for us over the past year has been an incredible experience, and God has further showed us the beauty of the Sacrament of Marriage and family life through their love for us.